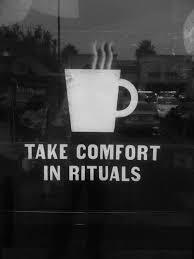 I have been thinking about rituals a lot lately. The holidays are fast upon us and that would be enough of a reason. This will be our first Christmas/Hanukah season with all four of our kids around us (our two sons and both their wives). That in itself calls for new rituals — and we have asked each of our new daughters to bring with them a ritual from their family observances that we can incorporate into our own. This is also the first holiday season when we’ll be on Martha’s Vineyard instead of London. The old ritual of ambling through the holiday markets along the Thames will now be replaced with the street fair of Christmas in Edgartown; Nutcracker at Covent Garden gives way to a visiting company’s Nutcracker in the High School gym. * Before I even sit in front of my computer or put my notebook on my lap, I meditate (with the help of Headspace. Do you know it? If not, check it out). That in itself sets up a space between the me outside my office, and the me inside it. * I have a green woollen shawl that I bought during one of my stays at the Anam Cara Retreat. Regardless of the season, if I’m writing I get cold. I throw it around my shoulders. * I break up my writing session automatically at the same time. Then I go get a cup of tea. Not coffee. Not a new age infusion. PG Tips with a little milk (okay – almond milk, but that has to do with sinuses rather than coolness). And there are others. But I guess the point is that rituals, no matter what they are, how silly or idiosyncratic, are important, and especially when you are doing creative work. Work like that needs the ability to be both present and away at the same time. It’s not an easy thing to do. 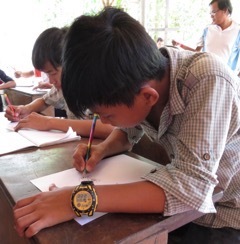 For our students in Writing Through workshops, we use a magic pencil which we give to each participant. That pencil is their vehicle into a new part of their brain. Rituals transport us. We’d be stuck without them.